A global survey of executives finds that most view the world as increasingly risky, with many reporting a “significant operational surprise” over the past five years. However, the majority of executives also report that their organizations are not developing more robust risk management processes. “These findings are particularly timely, given the political, economic and social uncertainties that businesses are facing in the United States and abroad,” says Mark Beasley, co-author of a report on the survey results and director of the Enterprise Risk Management (ERM) Initiative at North Carolina State University. The report, “2017 Global State of Enterprise Risk Oversight,” conducted by faculty who lead NC State’s ERM Initiative is being released June 28 as a part of the CGMA Report series jointly commissioned by the American Institute of Certified Public Accountants (AICPA) in the U.S. and the Chartered Institute of Management Accountants (CIMA) in the United Kingdom. The report is based on a survey of 586 chief financial officers and other senior executives of organizations in sectors from manufacturing to insurance to nonprofits. Results in the report are organized based on four geographic regions: Europe and the United Kingdom; Asia and Australasia; Africa and the Middle East; and the U.S. Approximately 60 percent of executives reported that the volume and complexity of their risks have increased over the past five years, though there was some variability across regions. 61 percent of executives in Europe and the U.K. reported an increase, 55 percent in Asia/Australasia, 76 percent in Africa/Middle East, and 59 percent in the U.S. There was significantly more variability across regions in reporting “significant operational surprises” over the past five years: 53 percent in Europe, 46 percent in Asia, 71 percent in Africa, and only 32 percent in the U.S. Given these widespread surprises and perceived increase in risks, one might think that executives are embracing ERM processes to better protect their organizations. But the survey found that the level of risk management oversight is relatively immature. “ERM is essentially an approach in which executive leadership looks at all of the potential risks an organization may face and develops plans to address those risks from the top down,” Beasley says. However, few executives said that their organizations had put thorough ERM processes in place. For example, while 53 percent of executives in Europe reported increasing risks, only 21 percent reported having complete ERM processes in place. And only 24 percent of executives in the Africa region reported complete ERM processes, with the number rising to 26 percent in the U.S. and 30 percent in the Asia region. In addition, 80 percent of executives surveyed reported that their organizations don’t conduct any formal risk management training for their executives. “We’re seeing a major disconnect between how organizations perceive their challenges and how they are responding to them,” Beasley says. “However, we also found that boards of directors, especially outside the U.S., are calling for executives to be more proactive about addressing potential risks,” Beasley says. 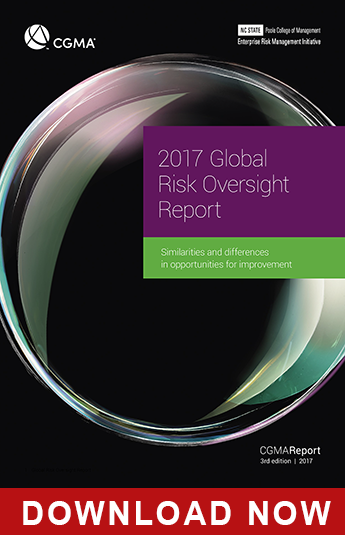 Specifically, the survey asked executives whether their boards of directors were asking for “increased senior executive involvement in risk oversight.” 56 percent of executives in Europe said yes, with the number rising to 59 percent in the Africa region and 70 percent in the Asia region. But only 38 percent of survey respondents in the U.S. reported the same pressure. 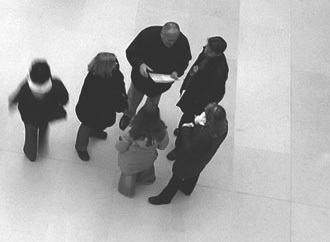 The report was co-authored by Bruce Branson, associate director of the ERM Initiative, and Bonnie Hancock, executive director of the ERM Initiative.